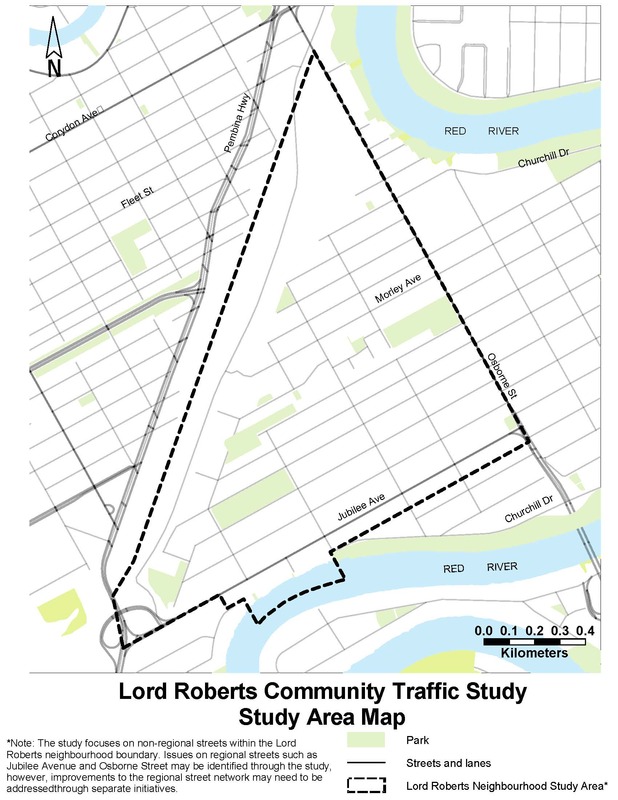 The City of Winnipeg is initiating a community traffic study in Lord Roberts. The City recognizes the ongoing traffic issues in the Lord Roberts neighbourhood and is working collaboratively with the community to identify solutions. The purpose of the Lord Roberts Community Traffic Study is to identify community traffic concerns, validate those concerns with real data, and develop and implement solutions to improve transportation in Lord Roberts. April 15, 2019 – You're invited to provide input on your experiences with traffic in the Lord Roberts neighbourhood. The feedback received by the project team will help determine what the community values most to identify possible solutions to improve transportation in the area. We want to hear from you! See the engage tab to learn more about a survey and workshop. January 2019 – Thank you to those who applied to be on the Public Advisory Committee. Advisory Committee members have been selected and invited to their first meeting to review and revise the terms of reference and determine the PAC's goals and objectives. We are currently in the "identifying issues" phase of the project. November 2018 – Sign up for project updates to stay up to date on the Lord Roberts Community Traffic Study. Apply to be on the project advisory committee if you would like the opportunity to work collaboratively with your neighbours and the City to identify issues and solutions throughout the study. Apply before January 2, 2019. More information on the Advisory Committee tab. Let's work together to identify traffic issues and solutions in Lord Roberts. Community involvement is a key component to this project. Feedback from stakeholders and area residents will help identify issues and formulate solution to improve traffic in the Lord Roberts neighbourhood. Complete a survey to tell us more about your vision, priorities, and locations of traffic issues you have experienced. The survey will be available from April 15 to May 15, 2019. Email lordrobertstraffic@winnipeg.ca to RSVP. For inquiries or for those who require alternate formats or interpretation in order to participate, please contact lordrobertstraffic@winnipeg.ca. A public advisory committee (PAC) will be developed to work with members of the community to identify traffic issues and solutions with those living and working in the community and the project team responsible for designing and implementing traffic solutions. A technical advisory committee (TAC) will also be formed in this phase. The project team lead and public engagement lead will act as links between the advisory committees. For more information about the PAC and to submit an application for consideration, visit the advisory committee tab. PAC meeting 1 – The first PAC meeting will be held to discuss what will be included in the study and to determine the PAC's goals and objectives. A public workshop and online survey will also be held to gather residents' feedback on traffic concerns and what they value most in their community. PAC meeting 2 – Another PAC meeting will be held to discuss the key issues from the workshop and survey and discuss the highest priority traffic issues in the neighbourhood. In this phase, the TAC will meet to discuss the plan for the engineering study and the project team will collect data on the traffic in the neighbourhood. The technical support team will analyze potential solutions and budget those solutions in order to present feasible options in this phase. PAC meeting 3 – Meet with the PAC to discuss options for trial implementation. This phase may also include gathering public feedback on recommended options. The PAC will be included in decisions around how and what to consult the broader community on. In phase 4, solutions will be tested on a trial basis, and public feedback and data will be essential to determining if the solutions we are testing are working. The community will be involved in a community walking tour and an ongoing feedback survey. PAC meeting 4 – the PAC will meet to discuss the trial and public feedback and provide input on the permanent implementation of solutions. The TAC will also meet to discuss the trial results. PAC meeting 5 – The proposed permanent traffic plan will be discussed at the final PAC meeting. Permanent implementation is expected in the fall of 2021. Approval from the Standing Policy Committee on Infrastructure Renewal and Public Works is required for solutions that fall outside the scope of the City's Traffic Engineering Improvement Program. After traffic solutions have been permanently implemented, ongoing monitoring and evaluation will take place and the team will continue to monitor feedback. If the PAC continues to meet, they can pass their feedback along to the team. Call 204-986-4243 or email lordrobertstraffic@winnipeg.ca if you have questions or feedback to provide. The Lord Roberts Community Traffic Study will trial an approach to community traffic management that is collaborative, evidenced-based, and informed by best practices and technical standards. Lessons learned from the Lord Roberts Community Traffic Study approach will be carried forward to future studies and used to inform an update to the City’s community traffic management process. The purpose of the Lord Roberts Community Traffic Study is to identify community traffic concerns, validate those concerns with real data, and develop and implement solutions to improve transportation in Lord Roberts. The study is a collaborative effort between community members, the City of Winnipeg, and other stakeholders identified throughout the process. Traffic concerns and solutions are identified through public engagement and substantiated with data collection and transportation engineering studies. The study considers traffic concerns of all road users. Traffic calming measures may be installed temporarily and monitored and evaluated prior to permanent installations. Public engagement, data collection, analysis, and implementation of traffic calming measures are implemented within available budgetary resources. The study focuses on non-regional streets within the Lord Roberts neighbourhood boundary. Issues on regional streets within the neighbourhood boundary that contribute to concerns on the non-regional streets may be identified through the study, however, improvements to the regional street network may need to be addressed through separate initiatives. Why is the City conducting a community traffic study in Lord Roberts? The City recognizes the ongoing traffic issues in the Lord Roberts neighbourhood and will work collaboratively with the community to identify solutions. Some of the ongoing issues already identified by community members include increased traffic from new development, on-street parking, cut-through traffic, transit operations, and speeding. Lord Roberts community members have already identified areas of concern, so why are you studying them further? The Lord Roberts neighbourhood has undergone changes in the past decade and we want to bring the community together to identify issues and explore all different types of solutions. This collaborative and multi-disciplinary approach will allow for the best solutions to come forward for implementation. What is the study focused on? Will regional streets be considered as part of the study? The study focuses on non-regional streets within the Lord Roberts neighbourhood boundary. Osborne Street and Jubilee Avenue are not included in the scope of this study. Issues on regional streets within the neighbourhood boundary that contribute to concerns on the non-regional streets may be identified through the study; however, improvements to the regional street network may need to be addressed through separate initiatives. The cost of trial and permanent traffic calming measures is not yet known. Traffic calming measures will be implemented within available budgets. During the study, costs will also include printing, mailing, and advertising. When will implementation of solutions occur? Trial implementation of proposed solutions is expected to occur in early 2020. Permanent implementation is expected in the fall of 2021. Approval from the Standing Policy Committee on Infrastructure Renewal and Public Works is required for solutions that fall outside the scope of the City’s Traffic Engineering Improvement Program. Will pedestrians and cyclist issues be included as part of the study? Active transportation experts will be part of the technical advisory committee. Traffic issues related to pedestrians and cyclist safety will be considered as part of this study. Will Transit issues be included as part of the study? Transit experts are part of the technical advisory committee and traffic issues related to transit will be considered as part of this study. Will parking issues be included as part of the study? Parking experts are part of the technical advisory committee and traffic issues related to parking will be considered as part of this study. Visit the Engage tab to learn more. When will community traffic studies be conducted in other neighbourhoods? Lessons learned from the Lord Roberts study approach will be carried forward to future studies and will be used to inform an update to the City’s current community traffic management practices. Following the update and lessons learned, community traffic studies in other neighbourhoods will be explored. PAC Meeting 1 – during the first PAC meeting, the PAC received an overview of the study plan, discussed how the PAC would function, advised on next steps and promotion, and revised the draft Terms of Reference. See the revised terms of reference. Up to 2 from other stakeholder groups in the area. The draft terms of reference will be finalized by the PAC once the group is formed. Are you interested in joining the PAC? Email lordrobertstraffic@winnipeg.ca to let us know. All those interested in joining the PAC are asked to email lordrobertstraffic@winnipeg.ca and provide your name, email address, address, reason for interest in joining the PAC, and connection to the neighbourhood. Those interested in applying to be on the PAC must provide their information before January 2, 2019. After the application deadline, PAC members will be chosen and contacted with details of the first meeting.